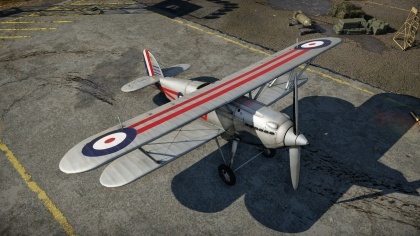 The Fury Mk I is one of the three reserve fighters in the British tree - the other two being the Nimrod Mk I (a naval version Fury), as well as the Fury Mk II. As a reserve plane, the Fury isn't a manoeuvrable or fast plane. Its armament, two 7.7 mm Vickers K machine guns, while equivalent to the armament found on most other reserve planes as well as some early Tier I planes, can take a while (and a bit of ammo) to destroy targets it will face at its tier such as Bf 109s, CR.42s, I-15s and even lightly armoured Ki-27s and A5Ms. 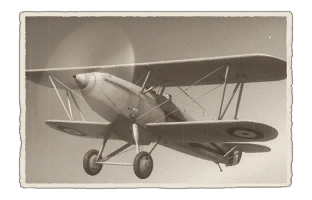 Use Universal or Stealth rounds with the Vickers K guns but keep in mind that unlike the current modeled Brownings as used on Gladiators, Hurricanes and Spitfires, these 7.7 mm guns won't do much damage unless you aim for the most vulnerable parts of your opponent's aircraft. The Furys in all their variants also turn decently, though they do tend to bleed energy easily and aren't the best planes in climbing or acceleration. The modelled fixed pitch prop will mean not much power is around for climbing at the start of the match - a problem also currently shared with the later Gladiators. If you want to use the Fury, the best advice is to side climb a bit at the start of the match so you at least have some energy to work with. Plan manoeuvres ahead and go for easy targets such as inattentive planes and Strikers destroying ground vehicles. Most of the problems with the plane are mitigated in Arcade Battles as traits like engine overheating and wing rip-offs are not modelled in that mode. Not very beginner-friendly due to its flying characteristics. This page was last edited on 29 January 2019, at 12:09.